As if the Thanksgiving on Route 66 trip wasn’t enough, now comes “Christmas on Route 66″. I’ve been wanting to get my dad out on the road with me for a couple of years & now he’s finally agreed. 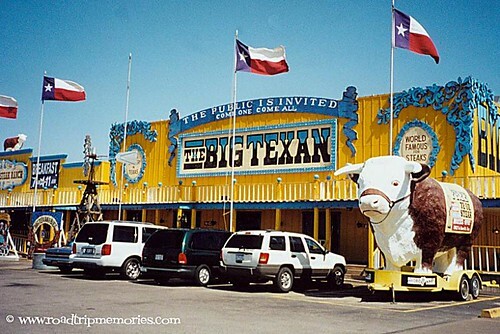 Destination: A Christmas steak dinner at the Big Texan in Amarillo. He’s picking me up Christmas Eve morning & we’re interstating Wednesday & Thursday and bunking up at the Big Texan Motel Christmas night after a steak dinner at the BT. Friday we’ll turn around and mosy on 66 Friday, Saturday, and Sunday. Should be a cool father/son bonding thing. I’ve always been intrigued by the story he told me of his family’s trip out to California in ’49. On the way back home…on Route 66…my grandpa had to be admitted in the hospital in Tucumcari, NM with stomach ulcers. Being the stubborn German he was, he checked himself out of the hospital 3 days later and my dad drove he & my grandma home via 66. So, I’ll be taking him on some of those sections of 66 that had been bypassed, but were in use in ’49, mainly in Oklahoma. 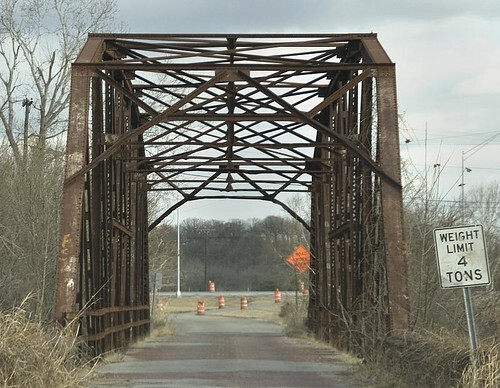 No, I don’t expect he’d remember much about those sections, but it’ll be cool to tell him that this abandoned stretch is the same road he would’ve driven 60 years prior when he was a teen. Anywho, I’ll be bringing along the laptop to provide updates as internet connections allow. This entry was posted by Pat on December 24, 2008 at 7:47 pm, and is filed under Road Trips. Follow any responses to this post through RSS 2.0.You can leave a response or trackback from your own site.